During a leisurely weekend brunch, I happened to mention to my husband how much I enjoyed making my own pressed eyeshadow, but that the actual pressing procedure was not just difficult, but prohibitively arduous. He asked to see how I made it (that's the kind of guy he is). I produced my make-up box and tools and demonstrated the procedure. After mixing the powders and pigments (the fun part), the pressing begins. 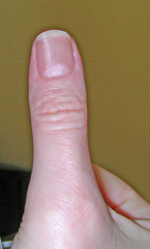 The first round is with the thumbs (until they are sore). Round 2 is pressing with this little hand-held tool (until the fingers are sore). 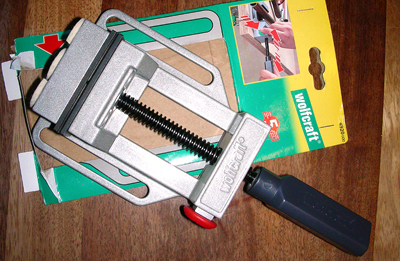 The final round of pressing is with this hand-held clamp (until the wrists are sore). I then demonstrated the drop test (to check if everything has been pressed enough). As I was explaining that re-pressing was almost always necessary, he casually commented "I know there's a vice available that would improve your pressing power by at least 10-fold. If you're interested, we could take a quick run down to the hardware store for a look'. Guess who had grabbed their purse and coat and was ready to go within a minute? Never in my life have I been so excited about a trip to the hardware store. Never in my life have I EVER been excited about a trip to the hardware store. 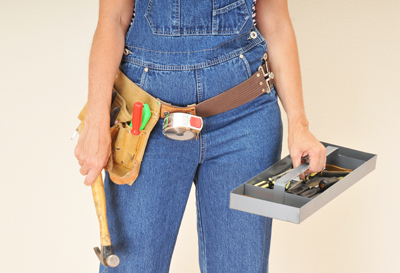 This time, however, I happily studied tools without even thinking about glancing at my watch. Instead of my usual impatient eye-rolling, I immersed myself in the hunt for washers of the right size and weight and found myself excitedly asking salespeople about pressure scales and torque power. Before long, I was exchanging hardware-related banter with other customers – and enjoying it! Here's what we came home with. A super-duper quick-action vice that leaves all others in the dust (when it comes to pressing eyeshadow). We're talking serious torque power with the simple turn of a handle and a wrist-friendly quick-release button. Although this model is normally used 'lying down', the construction of it allows for use 'standing up' (which is what I needed, and why we glued felt pads on the end). I also discovered that this manufacturer makes a selection of vices and clamps in sizes right down to the little hand-held model I had already been using. Therefore, ladies, if you are looking for pressing power and thinking you need a clamp or vice, remember the name Wolfcraft – they can deliver the goods! My husband had a few improvements in mind when he saw the hand-held tool I had been using. This required washers of specific dimensions. Here's how he created the other half of my ultimate eyeshadow pressing kit. 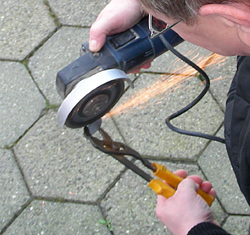 First, he shortened the handle on the hand-held tool to a specific height (using this noisy, spark-making, manly power tool that slices right through steel). Here's the result. 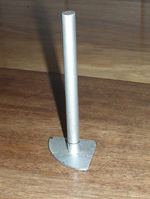 The edges of the shortened handle on the pie-shaped piece were sanded and smoothed. 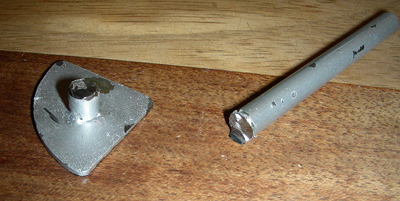 The cut-off part was discarded. 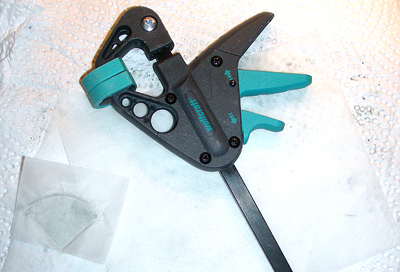 a pressing tool that looks like this. Note how perfectly the height of the stacked washers is level with the shortened handle to create a wide and even pressing surface. Not only does this odd-looking collection of stacked metal bits fit perfectly into the eyeshadow pans I use, it also easily slots in to both of my Wolfcraft pressing devices, allowing for all kinds of powder pressing magic and no more sore thumbs! Stay tuned to find out how I made pressed eyeshadow with these tools. Sometimes I feel like I am the only one in the world with this problem. I'd love a comment from you if you press your own eyeshadows/powder make-up. What do you use? How do you do it? Do your shadows stay pressed? Please share! thank you Sarah! I will check this out! Saw this post after leaving my comment about pressing vices. Checking out the Wolfy and sandwich press! Could you please update how you are doing with pressing? @Sarah Do you know of a video or blog that shows how to use the sandwich press and silicon pads? Love your Blog btw Lise!!! Thank you so much! It's so helpful. Just want a way to do more without my hands hurting. Thank you. Hey Lise, Thank you so much for responding! I will definitely try to keep a look out. Wish I spoke French, but checked out their youtube channel. And You are very welcome. Look forward to more post!